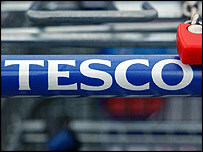 Tesco, Britain's biggest retailer, has reported a 13% rise in full-year underlying profits to £2.55bn. Group sales rose 10.9% to £46.6bn with its 1,500 UK stores bringing in sales of £35.6bn. The firm's international expansion continued, with 8.2m square feet of new store space being created abroad and total international sales up 18%. The supermarket chain plans to create 25,000 new jobs worldwide this year and open its first US store in Arizona. Shares in the group ended Tuesday trading up 1.3% or six pence to 461.75p, making it the second biggest riser on the main FTSE 100 index. Although Tesco has been expanding abroad, the majority of its profits still came from its UK network, with online and non-food sales soaring. Like-for-like sales excluding petrol in the UK - which exclude the impact of new stores - were up 5.8% in the three months to 24 February, up from sales growth of 5.6% in the third quarter. The underlying profit figure of £2.55bn excludes the reduction in Tesco's pension liabilities caused by recent changes to pensions regulation. When that is taken into account, group profit before tax came in at £2.65bn. Tesco's results also gave an update on its plans to realise the value of its property portfolio. Tesco originally said that the programme would allow it to return at least £1.5bn to shareholders through share buybacks, but it has now said it expects to return at least £3bn. It has already made deals with British Airways Pension Fund and British Land. With private equity firms circling a number of UK retailers - such as Alliance Boots and Sainsbury's - companies are under pressure to return cash to shareholders. Meanwhile, supermarkets are also under pressure from a Competition Commission investigation into the UK's £95bn grocery sector. With almost £1 in every £3 being spent on groceries in Tesco stores across the country, the group has mounted a robust defence of what some call its dominant position. Tesco currently holds a 31.2% share of the UK grocery market, according to the latest figures from market researchers TNS - more than the combined share of its closest rivals Asda and Sainsbury. 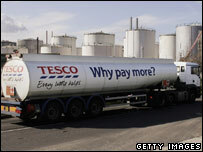 Its latest profit figures prompted calls from Friends of the Earth to "curb the power of the Tesco juggernaut". "The supermarket giant's market dominance is bad news as it allows it to dictate conditions to suppliers and to drive High Street stores out of existence," said campaigner Vicki Hird. Tesco is a British business doing well and deserves a pat on the back. However, the director general of the British Retail Consortium (BRC) dismissed the "myth" that shoppers are forced to use Tesco stores. "Tesco's competition - Sainsbury, Asda, Waitrose, Somerfield, M&S -- are all very powerful, very formidable and that's why the shopper gets a good deal," Kevin Hawkins added. "Consumers have got the benefit in terms of lower prices, better value, more choice." Has the Army made the right decision not to send Harry to Iraq?